By now, the profound idiocy of the White House Military Office’s decision to stage a terrifying photo op for an Air Force One jet over New York City on Monday has been widely, and rightly, condemned. However, I haven’t heard anyone offer any proactive, money-saving solutions… until now! Esteemed employees of our federal government, please allow me, your comically named Mother Jones contributor, to acquaint you with a magical, spell-casting piece of computer wizardry called Photoshop. With Photoshop, anything can be anywhere, at any time! Skeptical? Well, just take a look at some examples after the jump! Eager to show our government supports noodly indie electro-rock and the hipsters who flock to it? 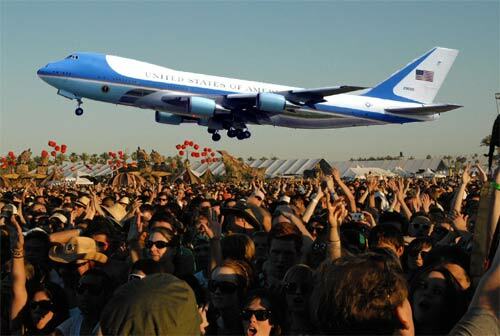 Let’s have Air Force One do a quick fly-by of the Coachella festival! But wait a minute! Unfortunately, while the jet engine noise would have flowed perfectly into My Bloody Valentine’s set, the wake turbulence could cause untold hairstyle damage. Therefore, an actual flyover just isn’t possible. So what do we do? Ladies and gentlemen, give it up for Photoshop! On a more serious note, say that perhaps you’re engaged in a delicate standoff with a ruthless, unhinged dictator. You’d love to swing by and give him the bird out the window, but that seems kind of dangerous. 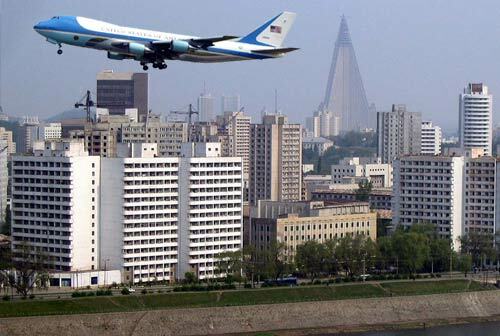 However, with the magic of Photoshop, Air Force One can be in Pyongyang in a flash, and what’s more, poor Kim Jong-il will totally believe it really happened! 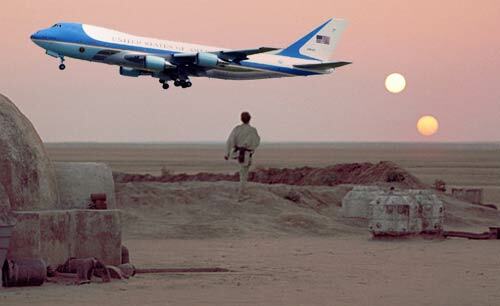 Perhaps most intriguingly, the magical powers of Photoshop mean that Air Force One can fly to places both real and imaginary. For instance, ever wondered what would have happened if our government intervened in the Imperial stormtrooper attack on Luke Skywalker’s aunt and uncle’s farm on Tatooine? We could have avoided all that Ewok crap! For your convenience, I now present a cost-benefit analysis. White House, please feel free to get in touch via Mother Jones.